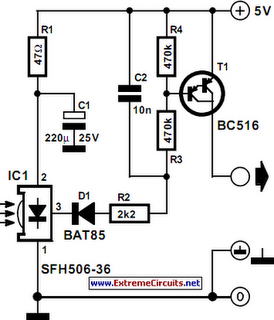 This very simple infra-red receiver is intended to form an infra-red remote control system with the simple infra-red transmitter described in this site. The system does not use any kind of coding or decoding, but the carrier of the transmitter is modified in a simple manner to provide a constant switching signal. Since the receive module, IC1, switches from low to high (in the quiescent state, the output is high) when the carrier is received for more than 200 milliseconds, the carrier is transmitted in the form of short pulse trains. This results in a pulse at the output of the receiver that has a duty cycle which is just larger than 12.5%. The carrier frequency used in the system is 36 kHz, so that the output frequency of IC1 is 281.25 Hz. This signal is rectified with a time constant that is long enough to ensure good smoothing, so that darlington T1 is open for as long as the received signal lasts. A drawback of this simple system is that it may pick up signals transmitted by another infra-red (RC5) controller. In this case, only the envelopes of the pulse trains would appear at the output of T1. This effect may, of course, be used intentionally. For instance, the receiver may be used to drive an SLB0587 dimmer. Practice has shown that the setting of the SLB0587 is not affected by the RC5 pulses. The receiver draws a current of about 0.5 mA.